DO YOU EVER GO TO OVERTON PARK? We have been discussing possible improvements to Overton Park. 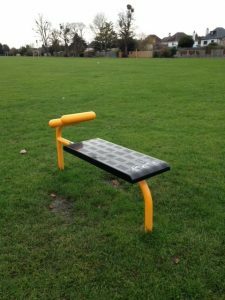 It is not in our Ward but adjacent, so much used by many of our residents. The park is mainly given over to playing fields, with a pavilion and a children’s play area. It is well used by joggers. It was in the distant past the playing fields of the London County Council and passed to Sutton Council when Mrs Thatcher abolished the LCC. It is flat and might be improved by tree planting or perhaps more daffodil bulbs. 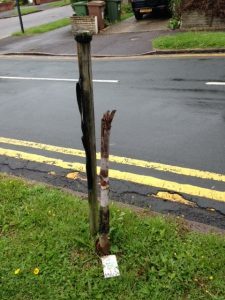 Sadly, some trees planted last year were vandalised. Might the metal “trim trail” equipment spread around the park be better used if it was brought together at one place? We would like to invite ideas. Do contact us if you have a view, at richard.clifton@sutton.gov.uk. The “Speed Awareness Signs” that warn motorists of their speed are very effective. We are finalising arrangements to instal more of these signs, in Grange Road and in Cedar Road. 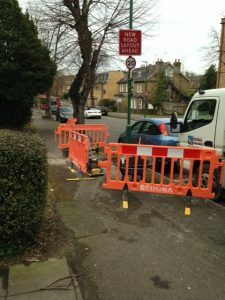 Locations have been agreed for the new speeding signs the Council will instal in Cedar Road. They will be slightly different from the ones in Farm Road, pictured, One sign in each direction, they will warn motorists of their speed as they approach the Langley Park Road junction. A study in 2012 found cars regularly speed in Cedar Road despite the humps and 20 mph speed limit. But residents were unhappy with a proposal for a width restriction. A re-arrangement of the parking places and the zebra crossing at the Brighton Road end have been of some help in slowing the traffic. Last year Richard took part in a police “Speedwatch” operation to record the speed of speeding vehicles in the road and was surprised at the speed some vehicles reached. 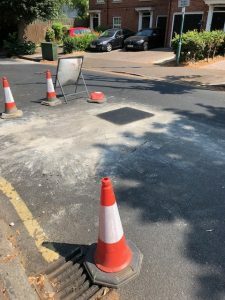 A lot going on in the Ward at the moment – the Council continues its programme of repairs to the potholes that were caused by the hard winter (which seems a long time ago now). This one in Langley Park Road. 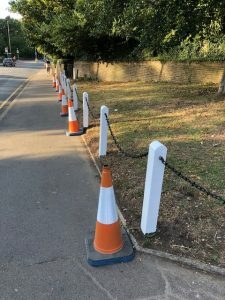 And repairs to the chain fence in Christchurch Park at the junction with Brighton Road, with repainting. We have said that one of our objectives is to protect the Ward from inappropriate development. At Sutton Council’s Planning Committee on 6 June Richard spoke in support of two residents from Allon Court in Eaton Road in a bid to overturn a recommendation from officers to permit the erection of a further storey on the roof of the block of flats, though the block is occupied and this would have been disruptive to residents. The developer wanted to erect a penthouse on the flat roof of the building. The higher building would also have blocked the light of residents in Cumnor Road. After a wide ranging debate, Richard and the residents persuaded the Committee to reject the application. Sadly, this may not be the end of the story if the developer goes to appeal – see our story below. 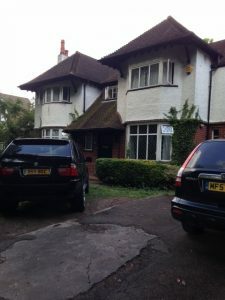 At the next meeting of the Planning Committee, on 4 July, Richard again persuaded the Committee to reject an application officers had recommended they accept, this to extend a house in Mayfield Road, The Highfields Residents’ Association had raised objection. 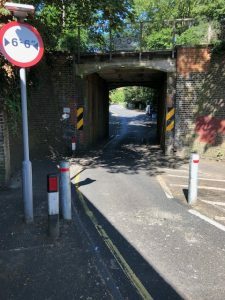 The width restriction in Grange Vale slows the traffic to protect pedestrians passing under the bridge, but we are going to slightly widen the gap for cars (moving the right bollard slightly further right or the left bollard further left, by about an inch). We were surprised when, at the first Local Committee meeting (the South Sutton, Cheam and Belmont Local Committee) since the election, at Overton Grange school, on 21 June, the big issue of the evening turned out to be whether the width restriction should be modified by moving the left hand post an inch to the left or the right hand post an inch to the right. A decision was left to the traffic engineers. 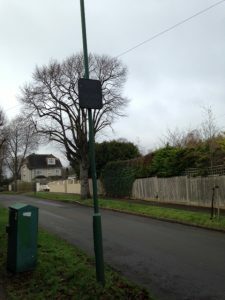 And two more of the vehicle activated signs to deal with speeding are to be installed, in Worcester Road and Grange Road. Above, the new low energy lights being installed, these in Cavendish Road. 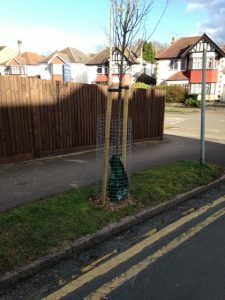 Below, the new tree replacing one that was vandalised (also pictured), in Willis Avenue. Note the protection against vandals. We regret that local democracy has again been overruled by the remote Planning Inspectorate, based in Bristol. 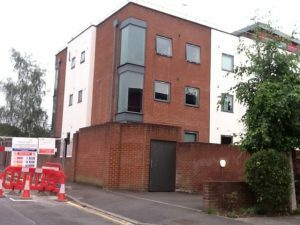 The proposed development of 81 and 83 Langley Park Road to demolish the houses and build a block of nine flats was turned down by Sutton Council but then granted on appeal by the Planning Inspectorate. The concerns of the Council largely related to design. We expect high quality standards of development in our Ward and could envisage a much more attractive development if this proposal was to go ahead. There were also issues about car parking, traffic and congestion, largely dismissed by the Inspector in his report. Our concern is with the outcome but also with the system. The Planning Inspectorate seems to us to have a bias in favour of development, come what may, and it seems wrong that local decisions taken by locally elected Councillors reflecting a local plan can be overturned with no further right of appeal. 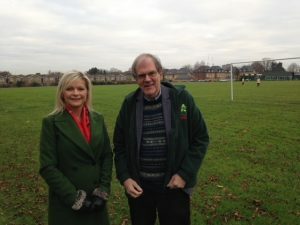 While this is a disappointing outcome, we will, as your local Councillors, continue to seek acceptable standards in proposals for development in the Ward. At the annual Council meeting where the new Mayor is elected, on 21 May, Richard and Trish got new jobs. Richard is to chair the new Audit and Governance Committee while Trish is a member of the important Housing, Economy and Business Committee. Steve Cook, who was Deputy Mayor when Richard was Mayor in 2016, was elected Mayor. Richard moved the nomination. This is his speech. “Madame Mayor, I wanted to begin my remarks by echoing what many others have said about the grace, dignity, hard work and commitment you have brought, with Councillor Heron, to the Mayoralty this year. So let me turn now to another Councillor who, I know, will bring commitment and hard work to the Mayoralty in this coming year, if Council accepts my nomination tonight. It gives me great pleasure to nominate, to be Mayor of the London Borough of Sutton for the year 2018-19, Councillor Steve Cook. I cannot resist beginning by saying that if you do accept this nomination it will be the second time in three years that the Mayor of Sutton has been a Muswell Hillbilly, as Steve and I discovered we share a common birthplace, a maternity hospital (sadly later demolished) in Alexandra Park Road in Muswell Hill, in north London. And for those too young to recognise the reference, “I’m a Muswell Hillbilly” is a song made famous by The Kinks pop group, who hail from Muswell Hill, and famous Muswell Hillbillies include Steve and myself, obviously, Ray and Dave Davies of The Kinks, Adam Ant and Alvin Stardust – so a really distinguished company of people. Let me tell you about Steve. Steve was born on the Queen’s coronation day, so every birthday is the anniversary of the Coronation, of Sir Edmund Hillary climbing Everest and of the D-Day landings. He left school as a teenager after the tragic death of his father and after he had himself suffered a major, life threatening illness. He became a runner in the Soho film business and was such a great success that by the 1980s he had his own large scale, thriving post production studios, in Soho, in London, and in Los Angeles. But Steve is a drummer, and in a particular milieu, Steve is famous, famous for the Steve Cook Soul Band, formed in 1975. The Steve Cook Soul Band was effectively the “house” band at the Grosvenor House Hotel in Park Lane for over twenty years, the industry favourite for charity balls and awards ceremonies, performing at numerous awards and film industry functions. I am told that at its height it had 17 members including musicians and go-go dancers. There are many stories about the band. There is a story that in the 1980s they played at the Istanbul Advertising Awards ceremony, followed by a live televised gig at the Istanbul Hilton, and an international incident was narrowly avoided when the skimpily clad go-go dancers were featured on the front page of the Turkish equivalent of the News of the World. The band lasted from 1975 until its last gig in 2010 – 35 glorious years. Steve became a Councillor in 2015 after being Chair of the local residents’ association which successfully campaigned against a huge McDonalds drive-through in Wallington. Now in some London Boroughs there is a tradition that whoever is Deputy Mayor one year then becomes Mayor the following year. We have not constrained ourselves in that way in Sutton but of course Steve was, with Councillor Patel, Deputy Mayor just over a year ago, so he has the experience to avoid the traps and be a great Mayor. And his wife Pauline, who had a distinguished career in education in Sutton – headteacher at Robin Hood infants school for twenty years and at Thomas Wall Nursery school for eight year – brought great dedication to the role of Deputy Mayoress, and will be an excellent Mayoress. 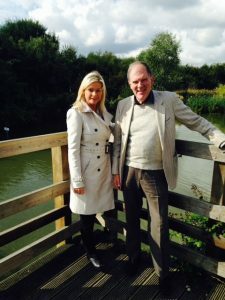 On 3 May Trish and Richard were re-elected as Councillors for Sutton South. 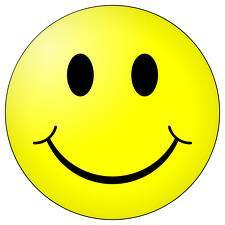 It is a pity our third candidate, Ed, did not also get in, but we are delighted with the result. It was inevitable that the LibDems would lose some seats in the election for the Council as it had done so well in 2014 and the decline in UKIP’s share of the vote was of benefit to the Tories. Trish and Richard are delighted at the confidence shown in them by local residents. The Council have pruned the cotoneasters at the triangle where Mayfield Road and The Ridgway join Farm Road. 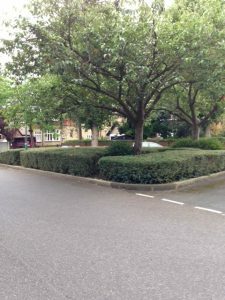 Periodic pruning is an essential part of the maintenance programme for these shrubs, and if they grow too high it affects visibility for motorists. The pruning always looks severe and has a stark impact, but these shrubs are robust and grow again quickly. 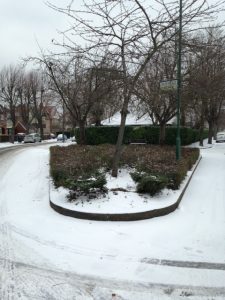 The snow on the day they were pruned makes the impact look particularly severe – contrast these pictures of the triangle on the day after the pruning and the triangle last summer. Cedar Road has a 20 mph limit but drivers often exceed it. 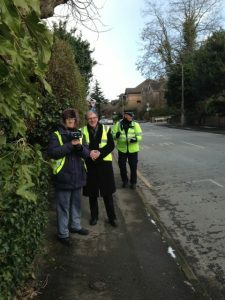 On the last day of February Richard joined local police officers and Jack Hamilton, the former chair of the South Sutton Neighbourhood Association, in checking speeds with a “speed gun.” Those exceeding the speed limit will get a warning letter and action will escalate if they are caught again.